AppOptics™ is the SolarWinds® next-generation Software as a Service (SaaS)-based application performance management (APM) solution. 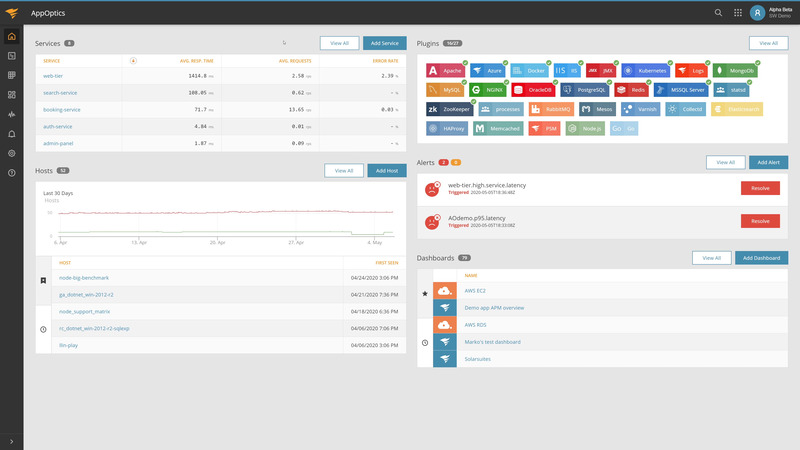 Designed to address the challenges associated with disparate monitoring solutions, AppOptics is a seamless application and infrastructure monitoring solution with distributed tracing, over 150 integrations, and custom metrics that all feed into the same dashboarding, analytics, and alerting pipelines. AppOptics is SolarWinds next-generation SaaS-based platform integrating application, infrastructure, and server monitoring into one seamless solution. Get real-time visibility into your application. Trace and visualize bottlenecks for faster troubleshooting. Collect high-fidelity metrics and detailed transaction traces to visualize trends, or for deep, code-level analysis. Monitor applications across a broad set of programming languages. Get instant visibility of your most important infrastructure and server metrics. The host agent is supported by an active, open community with a large and growing number of plug-ins available. The fully customizable, real-time elastic dashboards update automatically every time you add or remove infrastructure. If you use AWS®, the CloudWatch integration associates Amazon® Web Services performance data with your other metrics. Tie together your application, infrastructure, and business metrics. Aggregate and segment your metrics with multidimensional tags. Group and sort data to easily manage any size infrastructure. Compare past and present metrics to track disparities. Get a seamless, extensible APM and metrics platform that grows with you.